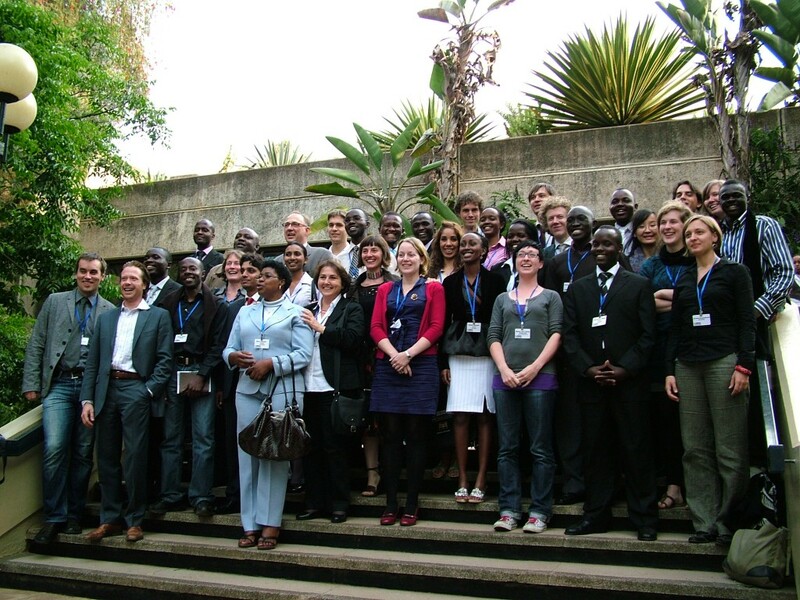 In 2010, ISOCARP celebrated the 20th Young Planning Professionals Workshop Anniversary during the 46st ISOCARP Congress in Nairobi, Kenya. At this occasion I had the honour and privilege to be the Young Planning Professionals workshop coordinator. Over a concentrated period of three to seven days, the YPPs work in closely-knit international teams, exchanging ideas and learning from each other. The workshops thus provide a synergetic platform where new ideas and creative solutions to complex and multifaceted urban issues are produced. The tangible results are then published in the attached Workshop Report. The intangible ones, however, stay in the hearts and minds of the participant YPPs, who not only learn from each other but often become life-long friends. The theme of the Young Planners Professionals Workshop was the integration of Kibera, one of the largest informal cities in East Africa, into the surrounding neighbourhoods of Nairobi City. Kibera is located about 5 miles from the city centre. This informal city houses between 170.000 and 1.2 million people. Conditions in Kibera are extremely challenging for the inhabitants because of poverty and lack of access to basic services like running water and electricity. Kibera originated when Nubian soldiers returning from the First World War were awarded plots of land, by the British colonial government, in the forests outside Nairobi. The colonial government allowed the settlement to grow informally because of the Nubians’ service as soldiers in the Allied Army in the First World War. After the independence of Kenya in 1963 the government declared certain forms of housing illegal, rendering Kibera an official unauthorised village. Over the years the inhabitants of Kibera increasingly rented out their properties to more tenants then were permitted by law. The rent in Kibera is very low and this attracted even more inhabitants, predominantly impoverished immigrants. In order to improve Kibera and transform the informal city into an integrated neighbourhood of Nairobi, various upgrading programmes have been started by the Kenyan government and UN – Habitat. These programs are aimed at improving living standards within the neighbourhood and improve the connectivity with Nairobi. 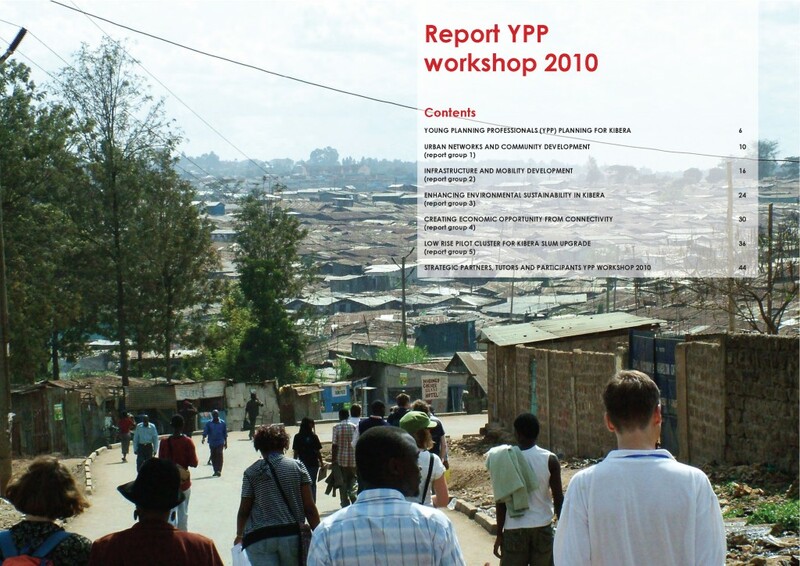 The main objective of the YPP workshop was to integrate Kibera in a sustainable way into the urban fabric of Nairobi. The study area was chosen to be an area of approximately 5 square miles located along the Ngong River and Nairobi Dam and about 10 km from Nairobi City Centre. The project area covered the informal city Kibera with its low income housing area including the Nyayo High-rise residential flats and Langata Road with adjacent residential neighbourhood of Dam Estate Onyonka, Otiende and Rubia. 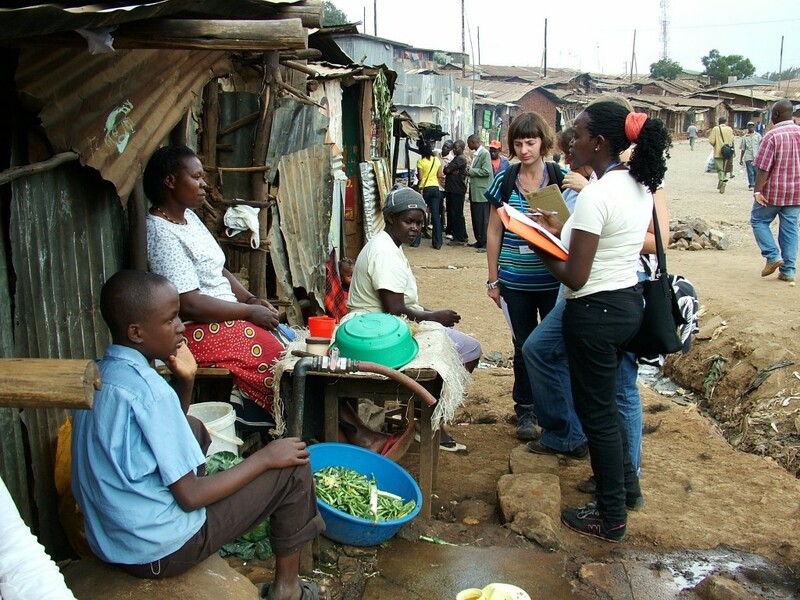 Through the analysis of the project area and the ongoing projects of the national Kenya Slum Upgrading Programme (KENSUP), as well as extensive field research within Kibera, the Young Planning Professionals had to draft a plan to integrate Kibera into the urban fabric of Nairobi while taking into account the challenges being offered by the need for sustainable cities. In order to integrate Kibera into Nairobi the Young Planning Professionals where divided into 5 working groups, each with a specific thematic area. 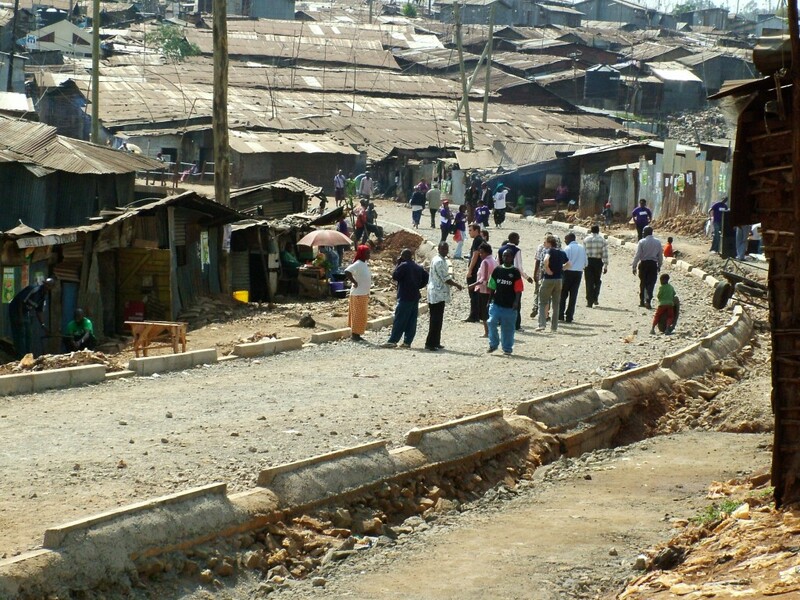 Urban networks & community development had the task to research how to promote the integrated development of Kibera and improve the accessibility and connectivity. The second group dealt with infrastructure and mobility. This group had to design a creative infrastructure and mobility strategy that would increase opportunities for the inhabitants. Another theme was environmental sustainability where opportunities had to be explored for the enhancement of sustainable environmental conservation & management within the settlement. The fourth group focused on the economic development of Kibera by framing and amplifying local economic opportunities. Group five focused on innovative designs for new shelters and houses in the informal settlement. 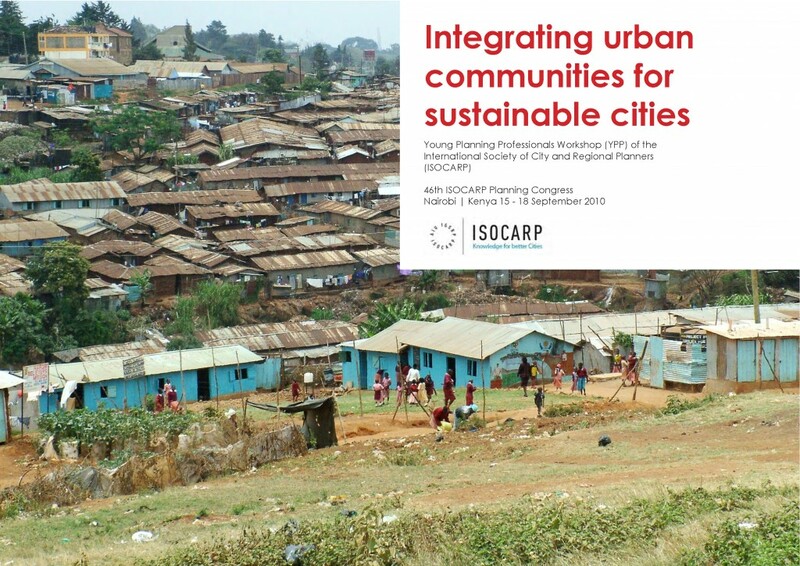 The results of the five working groups were presented on the opening day of the 46th ISOCARP congress hosted by the Architectural Association of Kenya, together with several Kenyan Government ministries, the Nairobi City Council and UN Habitat. The auditorium of the UN Habitat Campus, where the opening day of the congress was held, was packed with some 800 planners and other professionals from all over the world. The Prime Minister of Kenya, Raila Odinga opened the congress. He and his ministers gave a powerful introduction of the needs of their country, of the challenges presented by migration to Kenya’s urban areas, of the daunting task of tackling inequality and of the need to reverse environmental degradation. Over the past 20 years, ISOCARP has organised many YPP workshops, but this presentation of the YPP workshop had the biggest audience of all. Through the technical tours organised by the Local Organising Committee, many delegates had the opportunity to see Kibera, Africa’s biggest slum settlement, for themselves and to view the huge contrast between the wealth of Nairobi’s central area and this massive district where the very poorest people live. The ideas presented by the five groups of Young Planning Professionals coincided with five big ideas for achieving sustainable cities that were indentified by the General Rapporteur of the 46th ISOCARP congress. These were defined as integration, resilience, economic growth, a dialogue with traditional urban design and built form, and flexibility and adaptability of planning instruments. Young Planning Professionals workshops are great adventures for the mind and the soul. With their bright and outside-the-box ideas, the workshop participants bring hope to often-difficult planning problems are there to be solved and can be overcome. The participants of the YPP workshop in Nairobi came from all over the world. Most of them have not met each other before. Within hours after visiting Kibera and meeting the people of Kibera, they worked with an enormous energy and passionate drive. We got the spontaneous support of the many Kenyan students who worked with us for three days and nights. The presentation of their findings on the opening day of the ISOCARP congress, in front of hundreds of planners and eminent guests at the UN Habitat Headquarters, went very well and provoked discussions. Hopefully, the findings of the Young Planning Professionals workshop are useful for the future of Kibera. 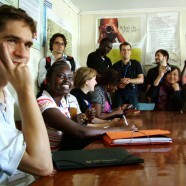 One thing I am sure of: Kibera and Nairobi will never leave the hearts and minds of the Young Planning Professionals.